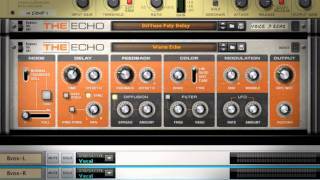 The Echo is the creative delay effect in the Reason Rack. The Echo is an advanced stereo echo bringing together the brilliance of modern delays with the organic sounds of analog circuitry and old-school tape machines. The Echo is equal parts pristine stereo delay, sound sculpturing toolbox, and playable performance effect. The Delay section contains settings for delay time, tempo sync, stereo width, and pitch. With Ping-Pong turned on the delayed signal bounces from left to right. Turning Offset up gives you a nice and wide stereo spread. Keep Pitch keeps the delay feedback in tune when modulating the delay time for bouncing ball effects. In the Color section limiting, overdrive, distortion, or tube distortion is introduced to the repeats. The band pass filter lets you cut frequencies from the repeats and boost them when the resonance is turned up. Use the distortion and resonant filter together for tape echo-like sounds. Lastly, the Modulation section features parameters for modulating the pitch and stereo image of the echos. The envelope bends the repeats, causing them to wander up or down in pitch. The Wobble emulates a tape speed wobbling effect and the LFO modulates the pitch of the left and right channels independently, introducing stereo spread at moderate settings and completely warping the signal when turned up to full. For further tweaking of the effect, try the Duck knob. Triggered by the incoming audio signal, it causes the repeats to duck like a side chain compressor. The Trigger and Roll modes let you play The Echo as an instrument, creating stutter and repeat effects on the fly.